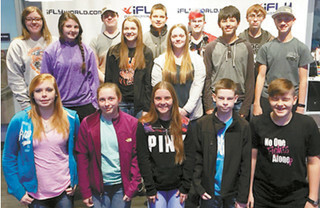 On Wednesday, March 8th, Cheyenne students visited IFLY in Oklahoma City. This is a facility where you can go to experience the feeling of the freefall part of sky diving, indoors! First the students were given a science lesson that centered on flight, the way wind travels, and terminal velocity. Then they were taken out to sit around the massive wind tunnel in the center of the building and watch a demonstration on how different kinds of objects fly based on their size and surface. The objects were several kinds of balls (kick ball, whiffle ball, basketball), and water that was splashed into the wind where it divided up into little droplets and floated around. Next, after a lesson on how to hold your body when flying, the students suited up in jumpsuits, goggles, and helmets to head into the wind tunnel themselves! One at a time, each student went in with an instructor who kept them headed in the right direction for a one minute flight. It was awesome to feel your body be scooped right up off of the ground by that massive blast of wind!